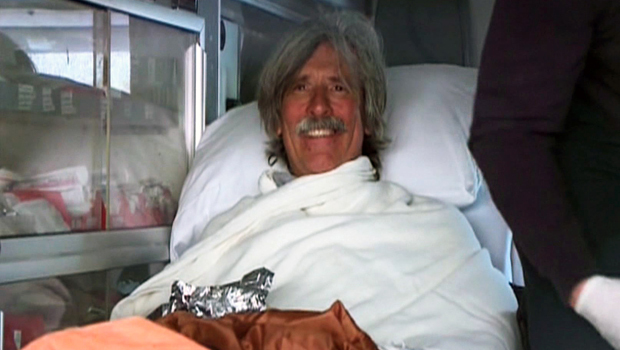 SAN FRANCISCO -- A Northern California man who survived two days in freezing temperatures in a snowy mountainous region said what he wanted most after the end of his ordeal was a hamburger. "I'm grateful. Thank you very much," Robert Root said Tuesday as he was loaded into an awaiting ambulance. He was taken to Sutter Auburn Faith Hospital in nearby Auburn, Calif., where he was treated and released by Tuesday evening, said Robin Montgomery, a hospital spokeswoman. Root said he wanted an In-N-Out hamburger upon his release, said Placer County sheriff's spokeswoman Dena Erwin. Root survived two days in a treacherous region by sleeping on a cliff and kept warm in freezing conditions by curling up in bushes, authorities said Tuesday. Root, 55, of Modesto, was wearing only a light jacket, shorts and running shoes when rescuers discovered him walking on a bridge on the Western States trail Tuesday afternoon, Erwin said. "It's just amazing. He was found alive, alert and talking," Erwin said. "Just amazing." The news of Root's discovery spread quickly in Modesto, said Heidi Ryan, who belongs to the same running club as Root. "I feel like I'm still a little numb, but that's just me," Ryan said. "I'm still processing it." Root was last seen Sunday morning before he became separated from fellow members of the ShadowChase Running Club along the trail near Foresthill. The group was training for the annual Western States Endurance run in June. Root was not going to participate in the race, Ryan said. The runners who were out Sunday were split into fast and slow groups. Root was initially running with the slower group. When his group briefly stopped, Root decided to run ahead and join the faster group, but he took a wrong turn on the trail, Erwin said. An extensive search began on the rugged terrain, but it was suspended due to darkness and falling temperatures. Root ended up on a cliff overlooking the American River, where he scooted into some shrubbery for warmth and slept off and on throughout Sunday night, Erwin said. More than 60 searchers resumed Monday using motorcycles, all-terrain vehicles, search dogs and two helicopters. Five members of the Tahoe Nordic Search Team spent the night looking for Root after snow began to fall earlier in the day. On Monday, Root spent the morning trying to find his way out, but he ended up back at the same spot, spending a second night in the same area, Erwin said. "He said his fingers were turning white and he would put them in his armpits to warm them up," Erwin said. Erwin said crews went looking for Root again Tuesday. Root decided to head "up and west," and when he got to the El Dorado Bridge, he saw a couple of people wearing bright-colored uniforms he thought were searchers and walked up to them. "They said, 'Are you Bob Root?'" Erwin said. "He said, 'Yes, I am.'" Ryan believes Root's training helped him survive. "He has great endurance and that obviously helped him," Ryan said. "I can't wait to hear what caused him to get off trail, but I'm so relieved that he's alive."